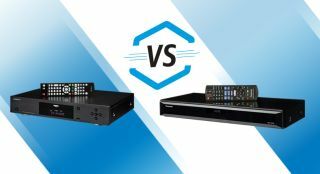 Oppo UDP-203 versus Panasonic DMP-UB900 4K Blu-ray players | What Hi-Fi? Oppo UDP-203 vs Panasonic DMP-UB900 – which is better? If the Panasonic DMP-UB900 and Oppo UDP-203 were Norse gods, they’d be on top of a snowy mountain, slinging lightning bolts at each other in a battle for ultimate dominance. The fact they’re 4K Blu-ray players, sitting on the kit-rack in one of our test rooms, doesn’t make their clash any less dramatic. The reign of 4K Blu-ray players is still in its infancy, but the kind of performance we’re already seeing is breathtaking. The Panasonic DMP-UB900 and the Oppo UDP-203 are at the pinnacle of 4K performance, both with glowing five-star reviews in the bag. It’s time to decide which deserves a place in your home cinema system. When it finally hit the shops in 2016, the Panasonic DMP-UB900 ushered in a new era of home cinema with its 4K talents, but it’s the Oppo UDP-203 that pushes the boundaries of 4K performance even further – in fact, it outshines the Panasonic in every way. But that doesn’t mean the UB900 gets knocked down a star: it’s still an astonishing player that does justice to your 4K Blu-ray films, especially when helped by a hefty price drop. We stick in the disc of Mad Max: Fury Road in 4K and the detail conveyed by the Panasonic blows us away. Every burst of flame is a thrilling event. Explosions are not just flat clouds of orange – you can identify the wisps of yellow and red as the flecks of fiery embers burn intensely. There’s plenty of dirt, blood and sand in the film, and it is all rendered with the sort of sharpness and clarity that almost makes us feel we’re viewing the picture through a magnifying glass. The benefits of High Dynamic Range (HDR) are obvious when you look at the brighter whites and darker blacks, with so many degrees of separation in between. Bright areas – the sunlight glinting off the hood of a monster truck in Mad Max, for example – sparkle enough to make you squint. And yet, in the same frame, the player reveals a huge amount of shadow detail in the darker areas, such as the dirt on the truck’s undercarriage. We’ve been using the Panasonic as part of our AV reference system for nearly a year now, but it still impresses with the right material. And yet, somehow, the Oppo UDP-203 outshines it with astounding detail levels. We thought Life of Pi on Blu-ray 3D was beautiful. In 4K, it’s spectacular. The colourful scenes of Pi stranded on the vast ocean while the sun sets around him are breathtakingly crisp and vivid through the Oppo. The yellow-orange sunset looks like molten gold reflecting on the shimmering water. The gradations in colour add a dimensionality to the picture that shoves 3D to the back of our minds. There’s a glossiness to the Oppo’s picture that makes it alluring, but it does so without compromising its hold on reality. Characters and objects seem to pop out from the screen, keeping your attention hooked to the pictures. That’s down to the layer upon layer of subtlety brought out by the Oppo. It makes more of a disc (4K or Full HD) than the Panasonic UB900: more clarity, detail and gradations of shading. Every ounce of detail – from the rough texture of sun-exposed skin to the silky smooth clear water – is rendered with stunning subtlety. Each strand of the CGI tiger’s fur looks so detailed that you want to reach out and pet him. Colours are effusive, inviting you to look deeper into every inch of the screen. There are so many intricacies in shading that we get lost looking into glowing blue depths of the bioluminescent water. The Oppo goes for an appealing colour balance that’s aimed to impress – reds, blues and yellows are richly hued – but don’t look unnatural. The Panasonic, on the other hand, is more understated. The player’s talents don’t get any less exciting when watching regular Blu-rays. Switch to a more natural-looking palette such as The Imitation Game and the skin tones are textured and shaded in a realistic manner. Even without the dynamic scope of HDR, the picture’s contrast remains strong. Daylight through windows shines brightly, while dark corners of rooms are textured enough to add depth to the scene. The Oppo fares even better when it comes to upscaling, which is good news for those with a large DVD collection. Once your eyes adjust to the fuzziness of Ocean’s Eleven on DVD, the picture holds up in terms of punch and colour dynamism. It doesn’t have anywhere near the clarity and insight of a 4K Blu-ray disc, but remains enjoyable. Panasonic drops the ball here – its picture is patchier than the Oppo, with low detail and blocks of colours that don’t do your DVD collection full justice. There’s little in the way of compression or motion artefacts with either player. The action remains smooth even when dealing with tricky slow-panning shots. Netflix 4K streams are all well and good, but 4K discs offer a solidity and stability that has yet to be achieved by streaming. A film’s soundtrack is just as important as its visuals or its story. In fact, the two combine to give you the full cinematic experience – watch a horror film on mute and it won’t be nearly as scary. Similarly, a disc-spinners’ prowess with sound is just as important as its dazzling 4K picture. It doesn’t matter if you’re playing a Dolby Atmos soundtrack or a standard 5.1, either, because the Oppo does exactly the same thing with sound as it does with its picture: give us more of everything. That’s not to say the Panasonic isn’t a fine-sounding device. On its own, you’d never describe the DMP-UB900’s sound as lacking. It’s rich and weighty, the dynamics are entertaining, and you can track the clear, articulate sound effects around the room. But listen to the UDP-203 and you’ll hear the soundfield open up: the scale of sound, the dynamics and the nuanced detail surpass that of the Panasonic. The soundtrack to Star Trek Beyond is a grand, dynamic affair through the Oppo. There’s a rousing sense of build-up as Michael Giacchino’s score blares through our reference PMC Twenty23 7.1 speakers, with the Oppo handling the orchestral dips and soars with plenty of grip and precision. Detail is crisper and punchier through the Oppo, too. There’s a real solid smack when aliens thud against glass windows, for instance, while voices go that bit deeper, sounding more natural and expressive than via the Panasonic. While the Panasonic is no slouch, Oppo’s snappy sense of rhythm serves stereo music better. Play The White Stripes’ Seven Nation Army on CD and the distorted guitars have texture and bite, the vocals shine through with attitude, and that defiant tone and tight rhythm pack a punch. We’re not expecting a revolutionary design when it comes to this next generation of disc-spinners. The standard blueprint of black, rectangular and metal and/or plastic is a formula that has worked across various technologies. As long as they’re built well and work smoothly, we’re happy. That’s the case with the Panasonic and Oppo players, although we’re pleased to say they look rather smart, too. Disc players don’t need to stand out like speakers or turntables – they’re designed to melt into your home-cinema room. And the clean, minimal design of these players does just that. They’re an understated symphony of brushed aluminium and black plastic, all assembled in a rigid chassis with clear displays. The UDP-203’s robust build feels reassuringly solid and hefty – more so than the lighter DMP-UB900. While the Oppo features a handful of control buttons on its front panel, the Panasonic favours touch-sensitive buttons to power up and invoke the disc tray. Discs load swiftly and are fairly quiet in operation. The speed is on par with regular Blu-rays, and the buttons are responsive, too. Backlit remotes are supplied, although we have to single out the Oppo for special praise here. The backlighting on the Oppo’s remote is motion-triggered, which makes it convenient to use in a darkened cinema room. It’s a genuinely useful feature that we wish more manufacturers would implement. You have to press a button on the Panasonic’s remote to activate the backlight. Though fairly standard practice, it feels a step too many after using the Oppo. That niggle aside, both remotes are intuitive to use with the players’ menus and playback functions. If you’re after a really well-specified disc-spinner, then you’re in luck as both these players have a generous mix of features to keep both AV and audiophile fans happy. The Panasonic UB900’s features list is long enough, but the Oppo 203 can more accurately be called a universal player – it’s compatible with a broader variety of disc and file formats. The basics are there: both players adhere to the 4K and HDR standards set by the UHD Alliance, from the larger BT.2020 colour space and 10-bit colour depth, to supporting HDR10 (found on all current 4K discs) and a brightness range of between 1000 to 10,000 nits. Long story short: they will play your new 4K Blu-ray discs accurately, and relate all the information intact to your compatible 4K HDR TV or projector. While there wasn’t much talk of Dolby Vision HDR when the UB900 came out in early 2016, we’re expecting to see discs with the alternative HDR format later in 2017. Oppo has said that it will be adding Dolby Vision support via a firmware update later in the year. It’s not just about 4K discs, though. These 4K players are, thankfully, backwards compatible, so you can still play your vast collection of CDs, DVDs and Full HD Blu-rays (in 2D and 3D) through them. The Oppo goes a step further by supporting older disc formats such as DVD-Audio and SACD, which the Panasonic doesn’t. Peek at the back of both players and you’ll find a generous number of connections. Twin HDMI outputs are supplied as standard: one that handles video and audio, and one that’s audio-only for older AV receivers. Also catering for non-HDMI receivers are 7.1-channel analogue outputs on both players, as well as digital coaxial and optical outputs. The Oppo is slightly better specified, offering three USB ports to Panasonic’s one. These USB ports will charge your smartphone, too. In the Panasonic corner is the inclusion of an SD card slot, which makes sense from the Japanese company’s point of view as it manufactures cameras that can film in 4K. Both companies have focused as heavily on the audio side as the picture. The internal DACs can handle high-resolution music files in all popular formats, including MP3, WAV, AAC, ALAC, FLAC and multiple DSD options. If you want to get into the nitty-gritty world of numbers, the Panasonic’s DAC is capable of 32-bit/192kHz, while the Oppo goes higher with 32-bit/384kHz. We don’t know anyone who has many music files with such high sample rates, but the option is there. Both players are DLNA certified as well, which means you can stream your entire music library from a NAS box and other connected devices. There’s wi-fi and wired ethernet connectivity on both players. Connection is speedy, but we’d pick the wired route for greater stability and to minimise the risk of dropped signals when streaming 4K shows. That applies more to the Panasonic, which includes apps such as BBC iPlayer, Netflix and Amazon Video – the last two offering plenty of 4K streams. The Oppo doesn’t come with any apps at all. However, considering most 4K TVs now come with the popular 4K video apps as standard, it seems fairly pointless to insist on their inclusion on a Blu-ray player. Oppo also claims that removing those extra features ensures the player is faster to boot up – which it is. Besides, you can always use the single HDMI input for plugging in streaming devices such as the Google Chromecast Ultra or the Amazon Fire 4K TV to make up for the Oppo’s lack of smart apps. If that’s the only chink in Oppo’s armour we can find, though, then surely its path to victory is clear. Norse gods are demolished at the end of their apocalyptic battle, but both 4K players have come out at the end with their pride intact, albeit a few scars. As far as head-to-head clashes go, it’s not the end of the world for the Panasonic DMP-UB900. The Panasonic comes out of this mighty fight with its head held high. It remains a five-star performer, with a drop in price making it an even more appealing buy. When first tested, it was £600; now you can get it for as little as £450. That’s one hell of a bargain. You might think the price-drop would surely put the Oppo UDP-203 on the back foot, but let’s put it this way: if you’re going to be investing in the 4K ecosystem – with the appropriate big screen, sound system and all the 4K discs – you’ll not only be able to afford the UDP-203, you’ll probably not mind paying the premium for that level of high quality performance. And the Oppo is demonstrably better than the Panasonic. Startling clarity and resolution, gorgeous colours and a strong contrast that means we can’t tear our eyes away from the picture on screen. It makes a glorious sound, too. It’s been a tough fight, but ultimately, the Oppo UDP-203 is the 4K Blu-ray player we’d take home, pop in a 4K film and let ourselves be immersed in the magic of movies.